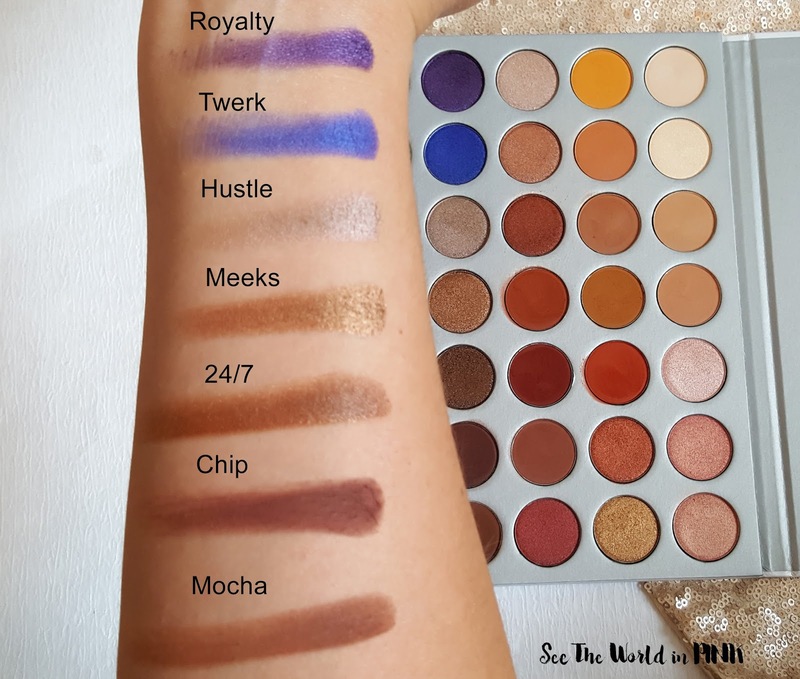 So, I know a lot of people aren't happy this collaboration is with Morphe - I haven't used their shadows before so I don't really have an opinion. I have subscribed to their brush subscription before and been pretty happy with what I received and the quality. I don't quite get why there was so much drama with the release of this palette, but I'm excited about it! The packaging is pretty simple - cardboard container with white and silver. 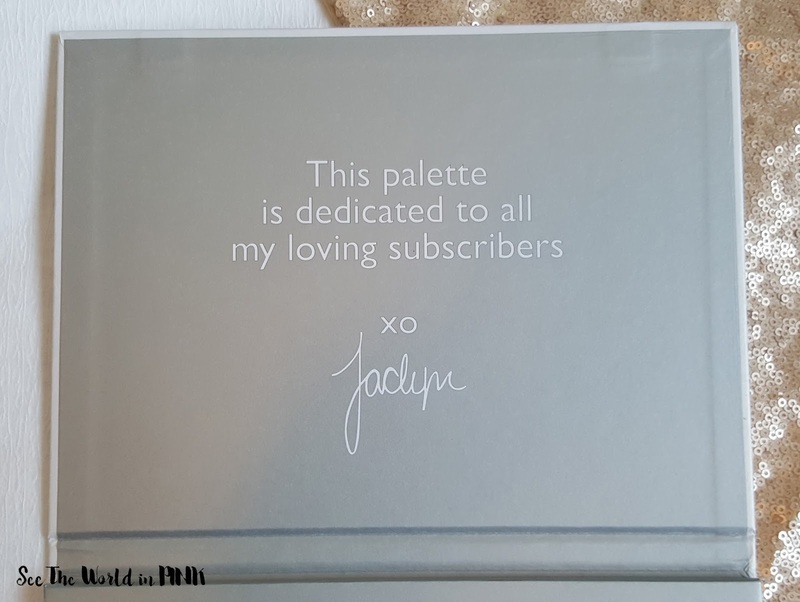 The inside of the palette has this inscription. I do really wish this palette had a mirror instead! This is certainly described as a full palette for lots of uses (including travel - even though it's quite big). In my mind, a palette this big it would be great to have a mirror! The shadows are beautiful - there is a whole range of mattes, satins, shimmers, duochromes, foils, and glitters. I love the shades. There is a lot of browns and lots of medium toned shadows, so a few shadows look similar but have slight differences, such as undertones. 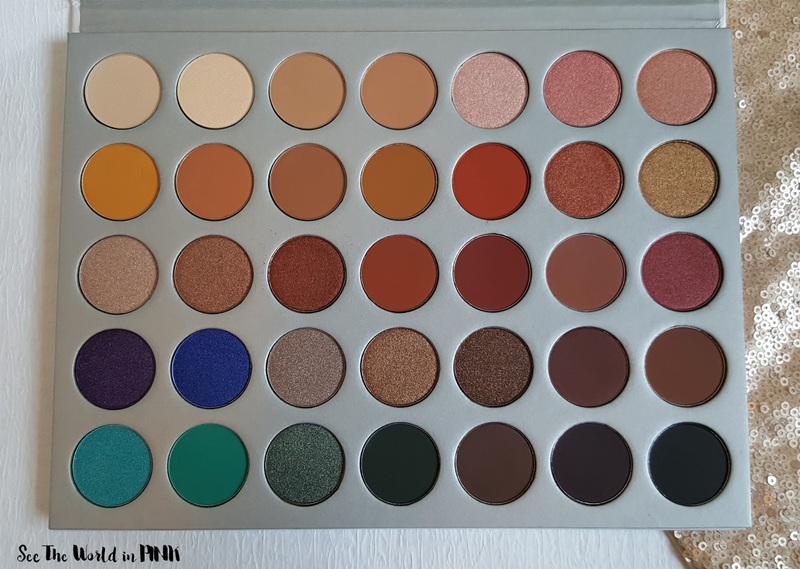 A lot of palettes neglect the transition shades, so this one has lots of them! 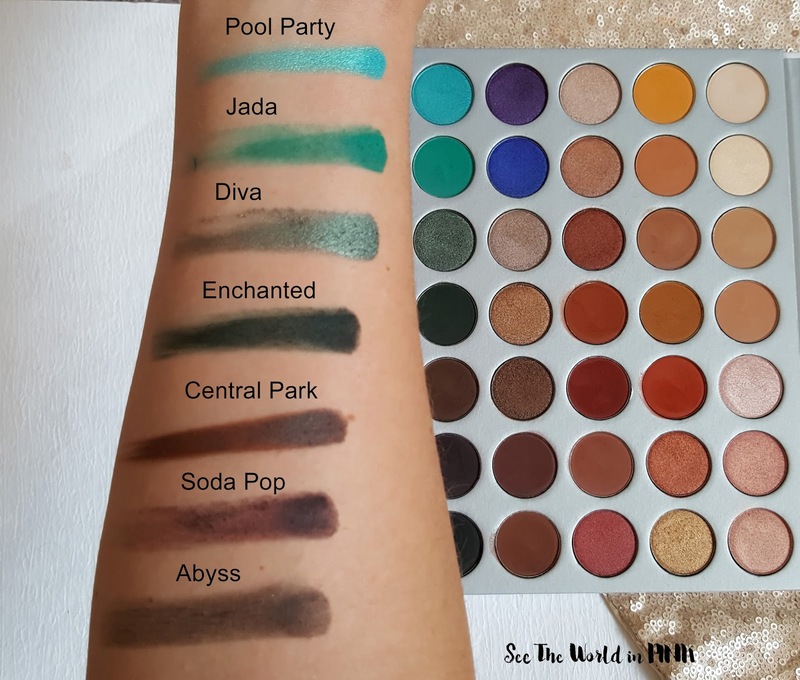 Also, the shadows are named and some customers got a print out sheet with their palette (for some reason I didn't, but it you can download it off the morphe website). 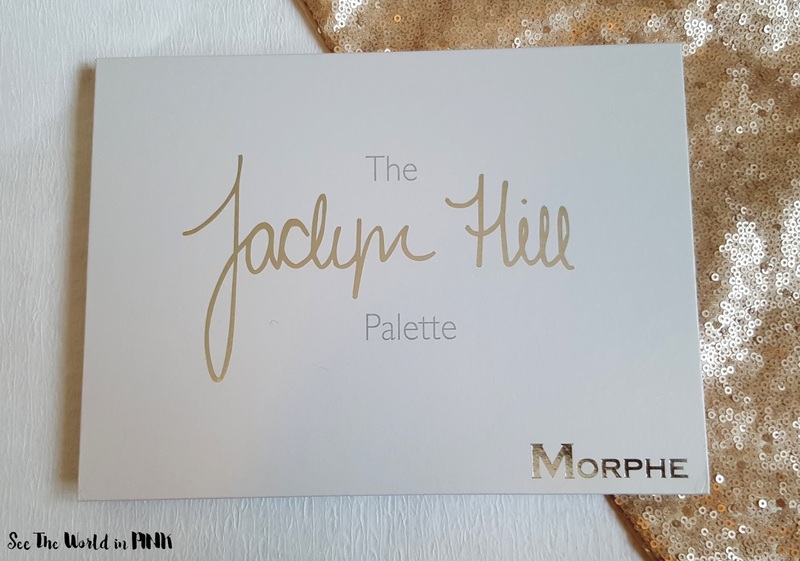 I do wish the names were written on the palette (even on the back would have been okay...), but they are not! 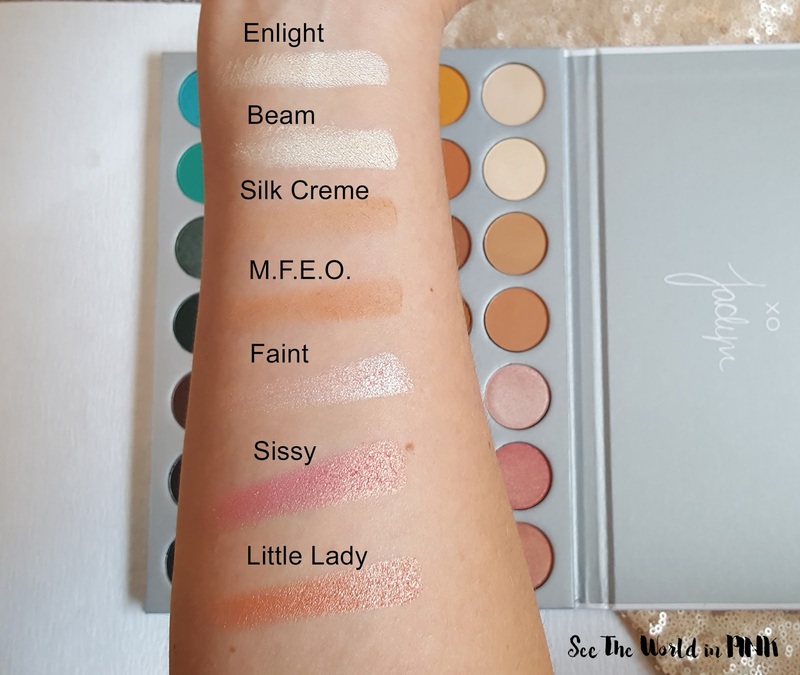 Here is a look at the palette swatched - all my swatches are done with my fingers, one swipe on my arm, taken in natural light with no editing. Enlight ~ An out-of-this-world, universal shade for brow bone and inner shadow magic. Beam ~ Amp things up with this frosted version of Enlight, it’s great for deeper skin tones. Silk Creme ~ Your transitional, creamy-matte crease color with yellow undertones. Faint ~ Love this princess shade. No matter how fair skin you are, this fiercely frosty shade goes great all over the lid. Sissy ~ For the rose-gold queens out there, this super-girly shade was named after my sister. Little Lady ~ I call my sister ‘little lady’ and this is her second fave color. Perfect to rock at the office since it’s not too gold or out there. It’s the perfect shimmery wash of neutral. This row all swatched really well for me - enlight/beam and silk creme/m.f.e.o are both such similar shades - I realize they have different undertones and work better on different skin tones, but I think this palette really could have had two additional shades if only one of each set was included. I'm a fan of the goldy pinks - but I should note there was fallout with faint, sissy and little lady. The shadows were all super smooth and buttery - Just what Jaclyn was going for. Creamsicle ~ OB-SESSED with this flattering yet daring color. Pop it into the crease to make the color of your eye’s pop. Butter ~ Super creamy with a warm, terracotta undertone makes this an amazing shade for your crease color. Pooter ~ For those of you not comfortable with super warm colors, this neutral chestnut shade, named after an inside family joke, is for you. Pukey ~ Yes, I named a color Pukey. My favorite matte color in the whole palette. SO creamy. SO pigmented. The ultimate warm brown. Hunts ~ Linda made this daring, boldly blendable shade happen. I love it because…it’s perfect. The creamiest shade in the palette. My fave shade of all-time. Firework ~ Dare I say this is the most shimmering shade? It’s great for all over the lid and for creating a warm, smoky eye. Partner it up with any of the matte orange shades. Queen ~ The perfect gold. I have nothing else to say. This row has lots of mid-toned browns - a lot of transition and crease shadows for you to choose from. Again, I think a lot of palettes skip over these shades so I'm happy to see a few options. Firework and Queen are both stunning shadows and will look amazing on the lid! All these shadows were super soft and smooth to apply. Obsessed ~ I was looking to create a shade for the perfect smoky eye. This took forever to get right, but it’s perfect and I’m totally, you guessed it, Obsessed. S.B.N. ~ One of my most-used, all-over-lid colors is this deep, pinky-bronze shade. It creates the perfect, smoky but natural look. S.B.N…N.B.D. Hillster ~ God, I love this color all over the lid or on lower lash line. I wanted a good range in this palette, and this is the deepest warm shimmer we have to offer. Roxanne ~ I named this after myself (my middle name is Roxanne). That may be narcissistic, but I don’t care. My subscribers know this is my favorite color in the world. I honestly use it every day on lower lash line or outer crease. Jacz ~ An actual burgundy with great color payoff. These high-pigmented mattes go through lots of rounds to make them this super creamy. Buns ~ This is Linda’s favorite crease color, but it took some time for it to grow on me. We removed it from the palette at least 5 times. I hated it at first, but now…obsessed. It’s a great everyday neutral shade for all skin tones. Cranapple ~ A true cranberry shade perfect for all over the lid. These shadows were all again very smooth and soft - I love the shades in this row. Obsessed, S.B.N. and Hillster are lovely shimmers. Roxanne and Jacz are super warm shadows and they are gorgeous! And cranapple is such a pretty shimmer! Royalty ~ I love it so much. The purplest of purples. A badass purple. No undertones. Just shimmery purple (I had to create one) that’s great to layer. Twerk ~ The reason this color is in the palette? I hate blue. I wanted to be able to wear an awesome shade of blue and this is it. Bold, fun and totally wearable with major wow factor. Hustle ~ For those of you not into warm shades, this is 100% cool with gunmetal, purple undertones. Meeks ~ The best bronze out there (and named after one of my best friends, because that girl loves her bronze). Not too metallic, and all ages can rock it whether you’re 14 or 40. 24/7 ~ Completely different formula than the rest of the palette: pressed glitter, baby. Apply with finger, or a very wet brush, for a sophisticated, fresh-from-the-runway look. Chip ~ I use this shade all the time to smoke out outer corner and lower lash line. Creamy, smooth and highly pigmented. Win, win, win. Mocha ~ SO chocolatey and super warm, perfect for deepening any eye look. These two deep browns - chip and mocha swatched so well, they aren't patchy at all which tends to happen with deeper mattes I find. I love the purple - I know from palette buying that purples are hard to get right and this one is so pigmented! The other shimmers in this row are pretty. Everything was again smooth and buttery to the touch! Pool Party ~ My favorite pop of color ever! Beautiful turquoise with flecks of glitter may seem over the top, but it’s not. It’s super wearable (just like a swimsuit). Jada ~ Named after my niece since this is her fave color in the whole world. Very similar to Pool Party, but with a matte spin. Diva ~ Bye-bye Christmassy green shades. 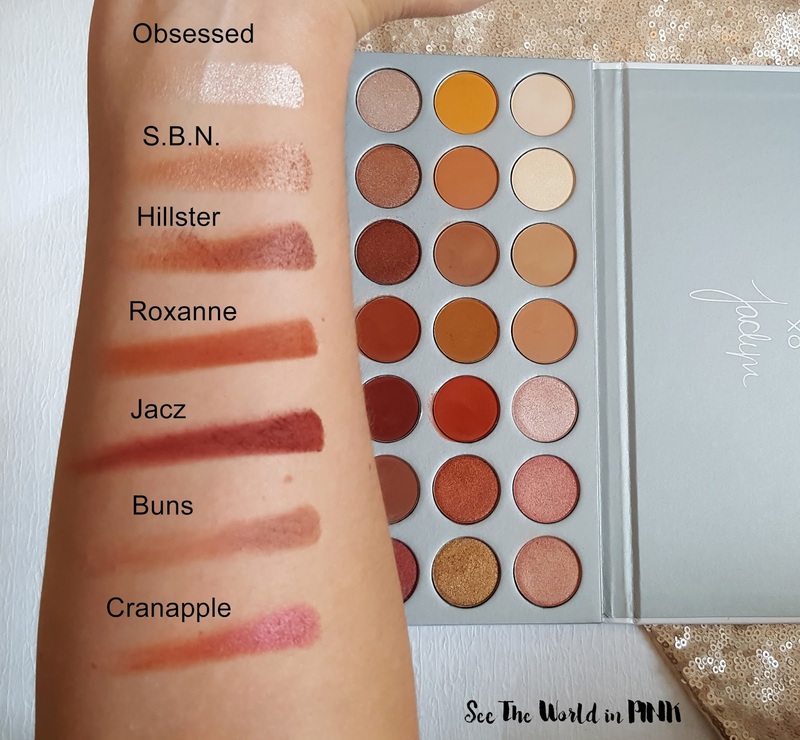 I so wanted green in this palette, but a neutral one to wear all over lids and layer with warm reds…and not make you think of Santa. Enchanted ~ his deep, matte green is Diva’s (and all the other green shades) partner in crime. Central Park ~ I wanted every woman and man to have the option of a cool, matte brown. Soda Pop ~ We were so excited to get this color perfect. So deep and so dark. You almost think it’s black, but it’s purple. And one of the most complementary shades for any eye color. Abyss ~ Matte and black as hell. One of the blackest blacks I’ve seen. So hard to make black rock, but we did it. This row was smooth and soft, but probably my least favorite overall. The deepest shades were a little patchy on me - enchanted, soda pop and abyss. Abyss is definately not a black as hell black to me. I'm sure the colour can be built up and this isn't applying them with a brush to the eye; this is just my first impression. Pool party and Diva are stunning. But, Enchanted and Jada actually left a little blue and green on my arms so they are quite pigmented. Overall, I do like this palette! Is it worth $90? It's hard to say - I know I love the shadows and the overall look of the palette. I think they worked really hard to make the formulas smooth and buttery. There is a lot of different finishes and colours and I love that! The majority of the shadows swatched really well and I imagine they will look just as pretty on the eyes! I'm happy with my purchase, even if it was a little more expensive than I initially thought it would be! 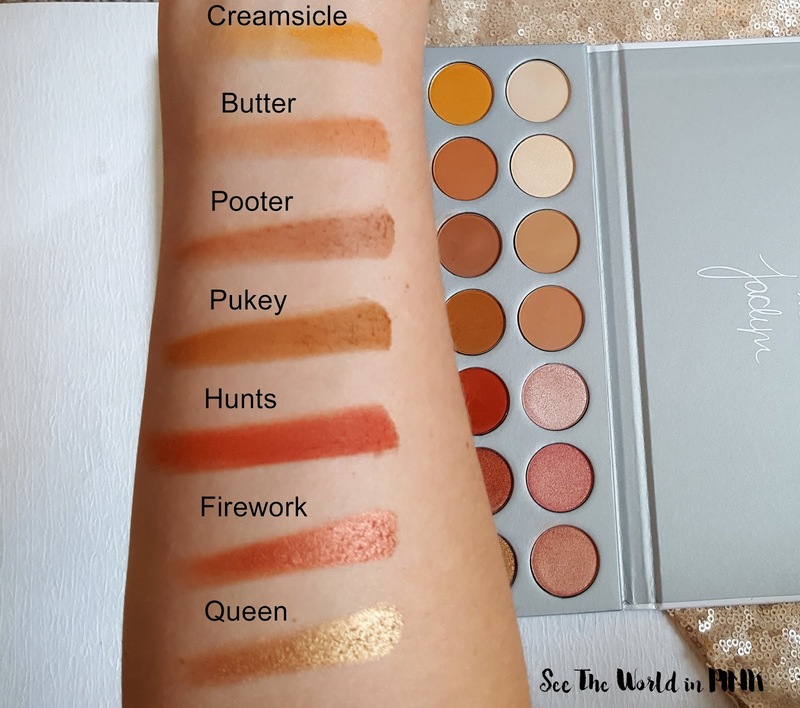 I will play with this palette soon and create some eye looks, but I wanted to get the swatches up to help you make up your mind for the relaunch tomorrow (July 18) - if you are reading this later, i'm sure there will be plenty of palettes to go around even if they sell out again! OMG this price of this just makes me want to cry.... and steers me away from it because of the price point specially to us Canadians. 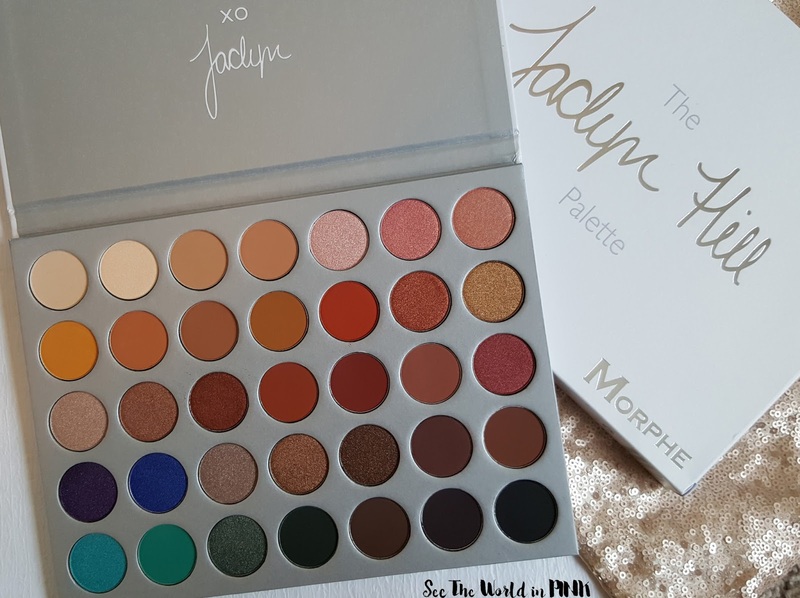 This pallet though omg it's so pretty and breaks my heart that I will not be getting this unless the higher-ups got another plan. Yes, it's supposed to be affordable but worked out to way more then some high end palettes!